“My God, it’s Reiss!” shouted Alfred Haggerty. The patrolman had noticed something at the bottom of the gaping pit at the intersection of 5th and Clearfield and stared at it for minutes before realizing it was the body of the missing police officer. “Policeman Vanished in Huge Cavein,” read the headline on August 2, 1959. Gunner’s Run, one of the many creeks buried by the city in the 1880s, still flowed in a 12-foot brick conduit more than 20 feet below. This creek-turned-sewer was out of sight and out of mind until the rains. Then came the caveins, again and again. In the light of day, Cheplick returned to the scene and choked back tears as he showed exactly where Reiss had fallen in. “It was here,” he told the Water Commissioner, pointing to one edge of the pit, “that’s where he disappeared.” The rescue team “descended into the sewer and penetrated to within fifty feet of the collapsed wall, but saw no sign of the missing patrolman.” As hopes of rescue turned to recovery, few expected that Reiss’s body remained close to the cavein. The sewer overflow emptied out in the Delaware two miles downstream. That’s where a Harbor Patrol boat idled in the Delaware River, just off the foot of Somerset Street and Port Richmond. After a week of waiting and watching, that patrolman Alfred Haggerty spotted Reiss’s body in the the crater at 5th and Clearfield turned out to be the only break. Immediately, “police and firemen erected a platform in the pit about 15 feet from the bottom and then began lowering a ladder to the bottom… A crane was swung into position to recover the body.” Then, “suddenly, the water fed by the afternoon’s heavy rains swirled up over the body” and carried it away. A mile and three-quarters downstream, beneath the pavement at Richmond Avenue and Somerset Street, Water Department workers Anthony DiNicola and Edward Potts had been maintaining a watchful vigil. And it was there, less than an hour after Haggerty spotted Reiss, that they would recover his body from a 12-foot square, concrete interceptor chamber. Two days later, after the viewing, the Police and Firemen’s bands lined up along Cottman Avenue and played “Nearer My God To Thee.” At the Requiem Mass that followed at the Church of the Maternity of the Blessed Virgin Mary, near Bustleton Avenue and Welsh road, “a detail of 100 policemen representing all branches of the department stood at attention” as the pallbearers, including Joseph Cheplick, passed by. In the front of the church, that sad Wednesday, as city and police leaders filed out after the Mass, stood Marie Agnes Reiss and her two children. Now, only Marie alone knew she was carrying a third child. 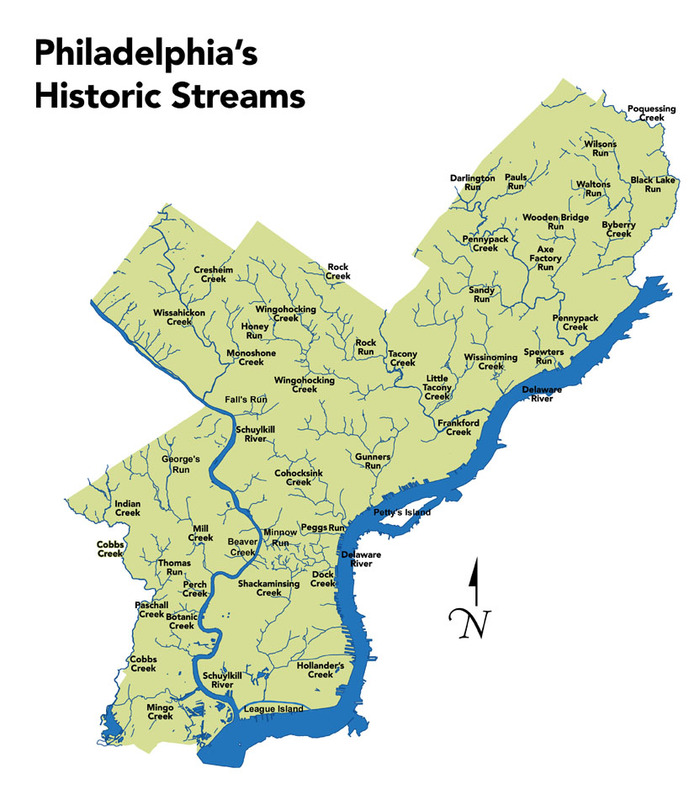 Thanks so much for the last three blogs on Philadelphia’s creek to sewer problem. What was convenience to end the problem of feculent once pristine streams in the 1800’s then became an opportunity to combine sanitary sewer with once only storm sewer needs after that. And the fact that the streams were so far below the grade of the streets being built meant that so much fill dirt, sometimes mixed with coal ash (please write something on the Wingohocking Creek and its relationship to the neighborhood Logan, or Mill Creek and how it has made havoc in West Philadelphia), creating unstable compaction, pushing down on the brick arches, creating a recipe for cave-ins like 5th and Clearfield Streets. According to a man that I have collaborated with at the Philadelphia Water Department through the past several years, the reasons for sewers being buried also had to do with politics. More houses in a neighborhood over a stream meant more potential voters in a ward, which could (I’m not sure of the exact process) keep current politicians in power for longer periods of time. Fortunately, reinforced concrete (often labeled RC in DOR photos) replaced things like brick arches and inverts and clay pipes, so there is in theory, less risk of collapses. But there is still enough brick sewers carrying small waterways that when a “freshet”, or a flood, in essence, occurs, all that water floods the limited capacity of those brick pipes, weakening them little by little; and all of the poorly connected sewer laterals from houses to sewers create washouts that cause sinkholes that over time cause cave-ins, too, that there will probably be more photos like Collection ID 47000-9 in the future.